Astrodon BIR-blocked Lumiance, RGB and 6 nm H-a. This is one of the first Astrodon ROAG-guided images taken on the 16" 3GT RCOS RC telescope at NMS. After framing M82, I rotated the ROAG -17 degrees from the upgright position, found a bright guide star, calibrated and started tracking with the remote STL guide CCD. I was suprised how few guide stars there were around M82. 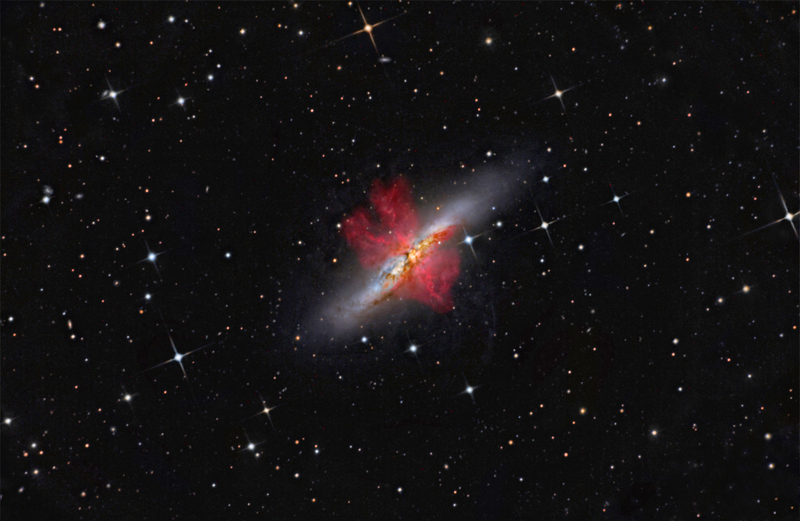 Excerpting from this work, M82 is the prototypical starburst galaxy with a rate of star production 10x of our own, likely due to a close encounter with M81, and is 12 million light years distant. A galactic "super wind" has formed from the outgassing of thousands of new stars and many supernovae, ejecting hydrogen and nitrogen at incredible velocities thousands of light years away from the core. We see this in my image from the HII emission. I’ve annotated some of the faint background galaxies using TheSky. Many of these range from mag. 17 to 18.1. Click to enlarge.